Panaji Sep 16 (IANS) The Goa Forward MLAs and independent legislators stepped up pressure on BJP leaders on Sunday to demand a permanent solution to the leadership crisis even as BJP MLAs queued up to meet representatives of the High Command in a bid to decide future course of political action in view of Chief Minister Manohar Parrikar s hospitalisation. Speaking to reporters before meeting BJP s central team comprising of General Secretary Ram Lal B.L. Santosh and Vijay Puranik Town and Country Planning Minister and Goa Forward President Vijai Sardesai said that he had the support of five other MLAs and that all of them in one voice were going to demand a permanent solution to the current crisis. "We six want a permanent solution. We do not want a temporary arrangement. This is what we are going to tell them " Sardesai said. The six lawmakers include three Goa Forward Ministers (including Sardesai) namely Fisheries Minister Vinod Palienkar and Housing Minister Jayesh Salgaokar two Independent Ministers Rohan Khaunte and Govind Gaude and another Independent MLA Prasad Gaokar. Representatives of the Maharashtrawadi Gomantak Party which has three MLAs in the 40-member Goa Assembly are expected to meet the BJP central leaders later this evening. A proposal to make senior MGP leader and Public Works Department Minister Sudin Dhavalikar a Deputy Chief Minister officiating as Chief Minister has been opposed by Goa Forward. 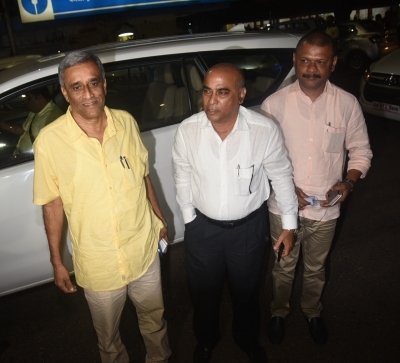 The three central leaders are in the state to find a solution to a leadership crisis which has arisen after Parrikar was shifted to the All India Institute of Medical Sciences in Delhi on Saturday creating a leadership void in the coastal state. The Bharatiya Janata Party (BJP) currently have 14 MLAs in the 40-member state assembly of which three are severely ill. And therefore support of allies is critical to the survival of the government. BJP MLAs who met the central observers all through Sunday afternoon have reposed their faith in Parrikar s leadership for now and have insisted that a new leader if needed should come from the BJP ranks. "Within the BJP they should find somebody and Parrikar should remain the Chief Minister till he is alive " BJP MLA Nilesh Cabral told reporters.